I’m back! I can’t say that I intended to take a full 6 months away from writing here, but it happened. My family and I have been through a lot of changes in that time that’s taken time away from creative ventures. Everyone is okay now and now that I’ve been able to find some time consistently to work and my creativity is returning to me, I should be able to catalog my projects here. How could I not? I have some giraffe print textured stretch twill SCREAMING to become jeans. You all know how much I love making jeans and writing about it. And perhaps blogging will give me the accountability I need to do like fire up the Singer and hem my sweet husband’s jeans. But for now. A jacket out of an old sweatshirt. Months ago, I picked up this pale green sweatshirt from the thrift store for $3. It’s just the shade of green I like, but it made my skin itch when I put it on and it wasn’t terribly warm…in other words, it was not a useful sweatshirt even though it was a perfect color. I washed it and stashed it away, figuring I’d remake it somehow on one of those days when you find a pattern to match what’s in your head. That day came when I came across Ottobre Woman’s 5/2014 issue (The jacket is Ottobre 5-2014-3). I had poked around on Polyvore trying to get some ideas for sweatshirts, but wasn’t really inspired until I came across an asymmetrical knit jacket (that I completely forgot to pin, dash it all). So it was rather fortuitous when I saw this pattern from said Ottobre issue. I deconstructed the sweatshirt and decided to quilt it together with fleece and random bits of knits I had leftover from other projects. All total, I used bits and bobs of 8 different fabrics. This project was a real stashbuster. 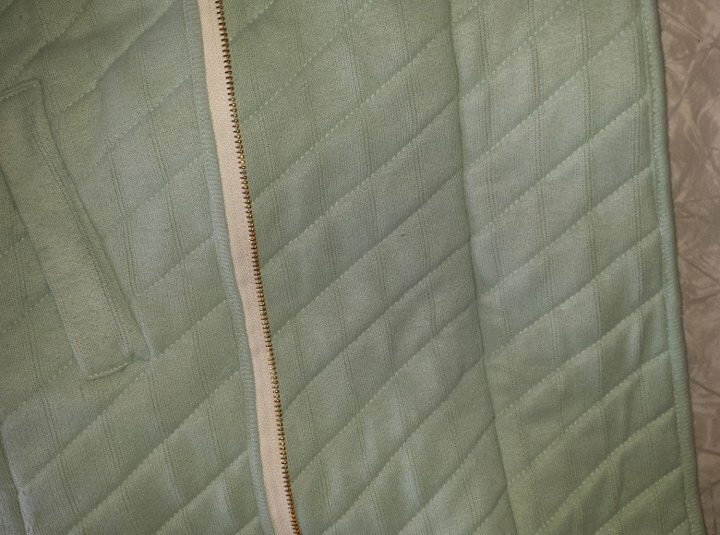 Because the pattern has a significant overlap of the front pieces, I did not have enough fabric to make the front of the jacket without piecing. I had already decided to use this great ringspun cotton sweater knit for the sleeves and the hood (which I also had to piece), so I had the sleeves of the sweatshirt available to add on to the front pieces. I put the seam at CF which seemed logical enough. 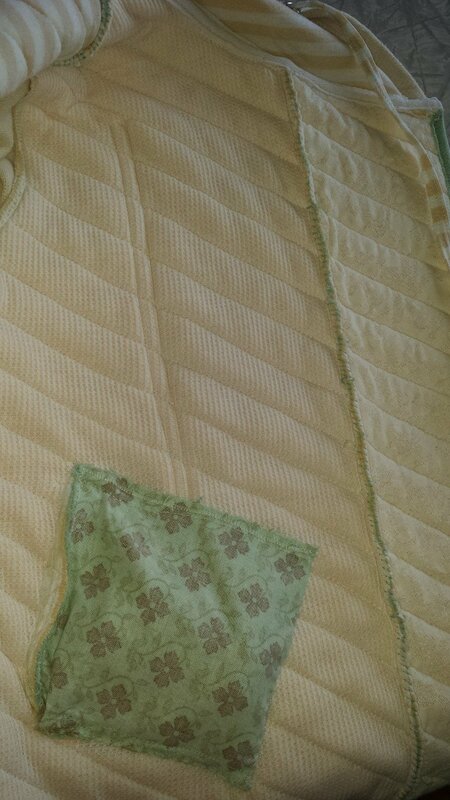 I quilted my sections of fabric before I cut out the jacket, which if I made a quilted jacket again is the way to go. My machine had an easy time with all of the fabrics, and I didn’t even need a walking foot. 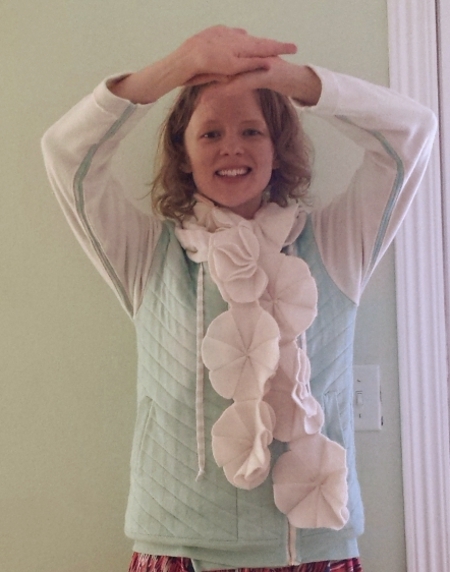 I did hand baste the layers of sweatshirt, fleece and knit together around the edges of my big sections that I quilted and then in a few places throughout the body of the piece. I’ve been stabbed too many times by pins, and hand basting is my m.o. anyhow. 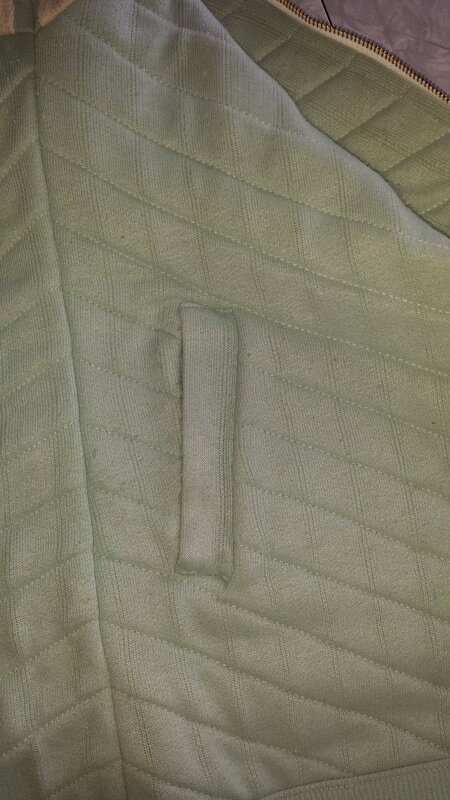 It helped that the sweatshirt fabric had these vertical lines running through it, so it was easy to accurately mark the 60 degree quilting lines I had decided on. I lined the hood with a knit leftover from this project (and another I will blog). The stripe knit gives the hood some nice support and extra warmth as well as some design contrast. Instead of twill tape, I used the same knit to make drawstrings for the hood. 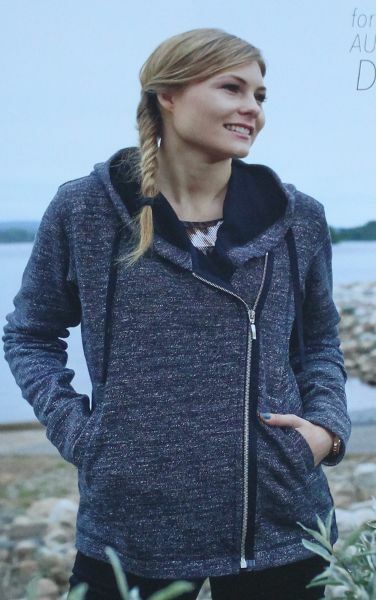 I really like how the hood is drafted in this pattern to go cross over CF just as the fronts do…it makes for an extra warm hood. I have not seen this in a hood before, and it’s an excellent design feature. It’s a good defense against windy Colorado days. Things were going swimmingly until I got to the welt pockets. Somehow I sewed BOTH of them on backwards. Ugh. A break and a couple cups of tea later, I unpicked everything and was able to resew them on correctly without a problem. 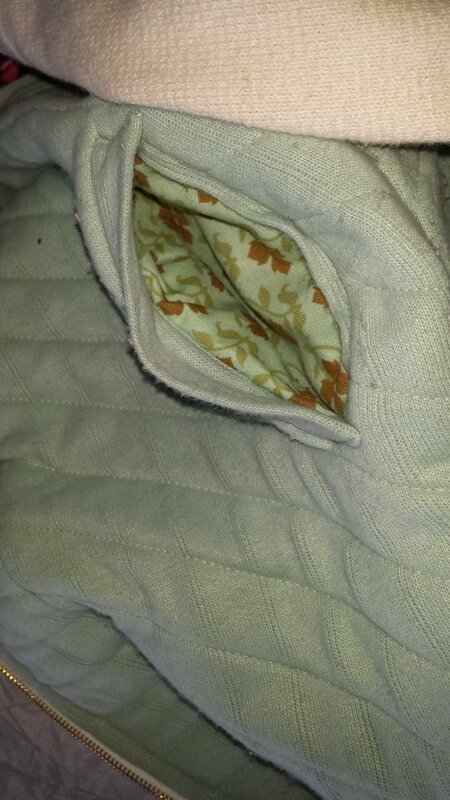 Despite the sweatshirt fabric being a knit, it was stable enough to handle the abuse even if my edgestitching is a little less than perfect and the pockets are lumpy from being worn continually for the past 2 weeks. The pocket lining is some Joel Dewberry quilting cotton (I love his prints!). 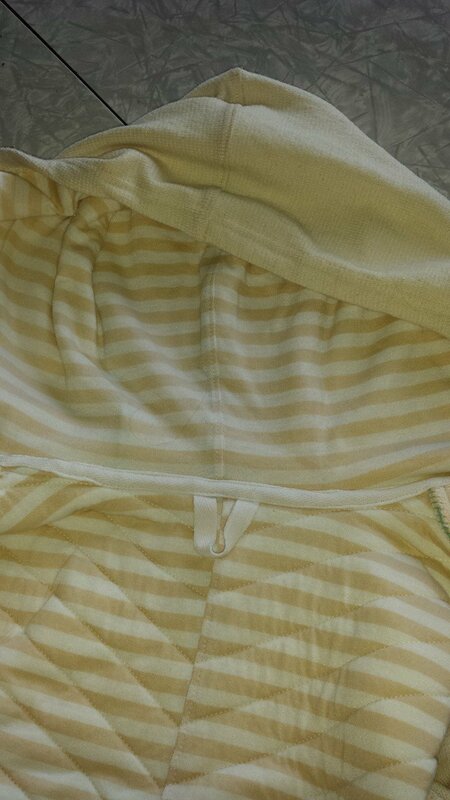 The pattern calls for an exposed zipper, but I don’t particularly like the look of the raw edge of the zipper tape. 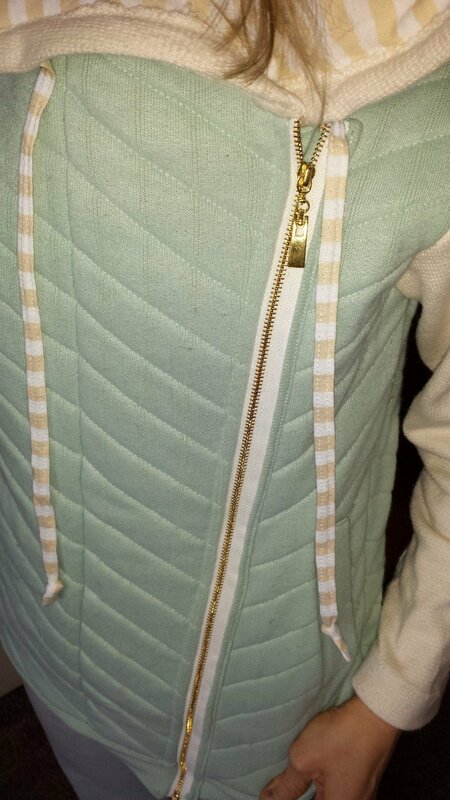 Instead, I trimmed the zipper with rib knit leftover from the sweatshirt neck. So I guess the zipper is semi-exposed. 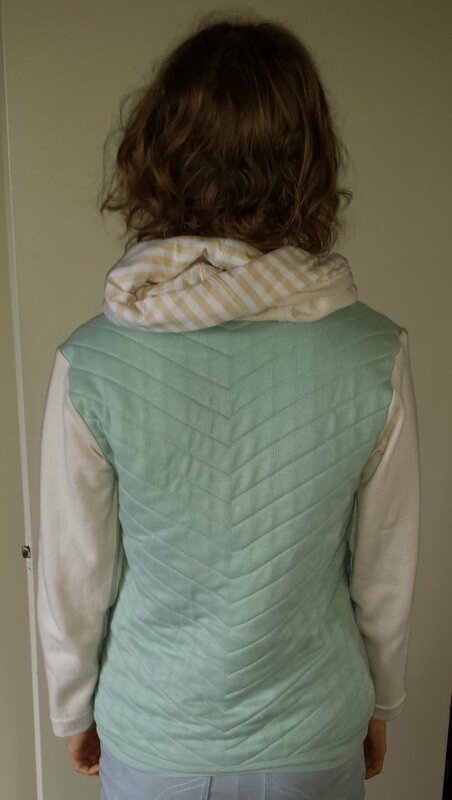 I finished the raw inside edge of the jacket also with rib knit from the sweatshirt sleeves. I didn’t know how much the quilting was going to affect the stretch of the fabric, so I gave myself a 1″ seam allowance on the side seams in case I needed extra fabric for fitting purposes. When I cut the sleeves, I had forgotten to add that extra inch, so I seamed and topstitched strips of the green fabric to the edges of the sleeves. As it turned out, I did not need the extra fabric at all, but I liked the effect of the green fabric on the underarms so much that I sewed my side/sleeve seams at 3/4″ so that the green was still visible. To finish off the bottom, I serged on the original rib knit from the sweatshirt. This worked out well because by the time all of the layers were quilted, another hem treatment would have been really bulky. The rib knit gave a nice finish to the bottom with no fuss. I have worn this jacket nearly every day since I made it. It’s highly possible that it will replace my much loved, stained and completely unstylish Metropolitan Opera hoodie (not a bad thing). And it’s good to be back here writing about something I love to do. I’ve missed everyone. 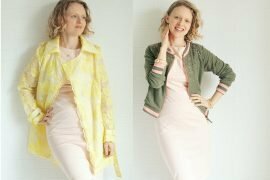 My full pattern review is here. Welcome back! I love the jacket–the striped lining is awesome. It looks so snuggly and stylish at the same time! Found you through PatternReview. 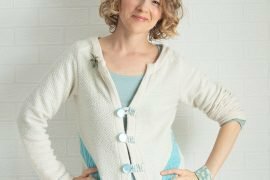 Love the sweatshirt – creative, stash busting and cuddly! Gasp! This is beautiful!!!! I love the color and pattern combination you chose. I can see why you’ve been wearing it continually. I would wear it everyday, too. Well done! Bravo! I made up this pattern, too, but not with the panache you managed. Love your use of multi-media fabrics. Now I want to make another.